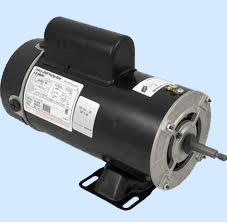 $233.95 BN61 Electric Motor free freight, $233.95 replaces waterway 3421221-OZ free freight, $233.95 executive 48 frame spa pump free freight. Brand new as received and tested by Motor Mfg. Big Savings! *Free Freight-One Way! Catalog number BN61 is a 48 Frame through bolt pool and spa pump motor: "LASAR-XL" Line (extra low running amps) 2-speed, UL 1081 and UL 1563 approved. Capacitor start, 2/4 pole, ball bearing. 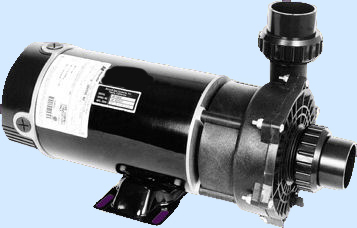 The BN61 is a pool and spa pump motor, 4HP on high speed and 0.25HP on low speed, 3450 RPM high speed and 1725 RPM low speed, 230 volts, 48Y Nema/IEC Frame, Full Loaded Amps 8.5 on high speed and 2.8 on low speed, Thermally Protected Auto-Reset, 1.0 Service Factor, 0.5" Shaft Diameter, 2-5/16" Shaft Length, Insulation Class B. 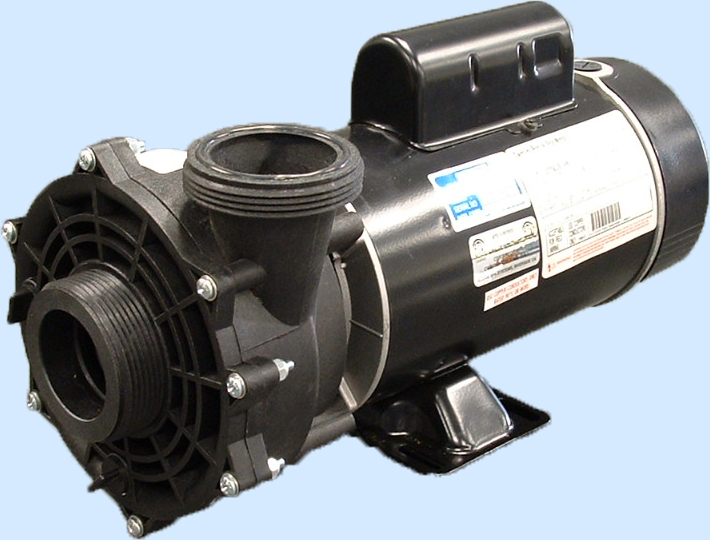 For years the BN61 has been used by Hayward Pool and Spa Pumps, Waterway Pool and Spa Pumps, American Products Pool and Spa Pumps, Zodiac Pool and Spa Pumps, Sta-Rite Pool and Spa Pumps, Pac Fab Pool and Spa Pumps, Vico Spa Pumps, Balboa Pumps, Aquaflo Spa Pumps, Gecko Spa Pumps, Premier Pool and Spa Pumps, Power Right Industries Spa Pumps and many other spa and pool pump manufactures. The BN61 was first introduced by Magnetek and continued to be produced by A.O.Smith and Regal Beloit. Currently it is produced under the Centurion name by Regal Beloit. It replaces all 48 Frame through bolt pool and spa motors with the same specifications that are made by Emerson Electric Motors, Franklin Electric Motors, GE Motors, Marathon Electric Motors, Dynatech Motors, SNTech Motors. For wetend detail drawings, click above. (1) Look for the label provided by the original electric motor manufacturer Manufacturers include "Century", "Magnetek", "A.O.Smith", "Regal Beloit", "Emerson", "Franklin Electric", "GE", "Centurion", "SNTech", "Dynatech". 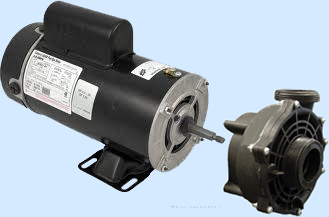 (2) Identify the voltage required (115 volts or 230 volts), "high" and "low" speeds (spa pump motors are typically 3450 RPM high speed and 1725 RPM low speed). Single speed motors are "high" speed (3450 RPM). 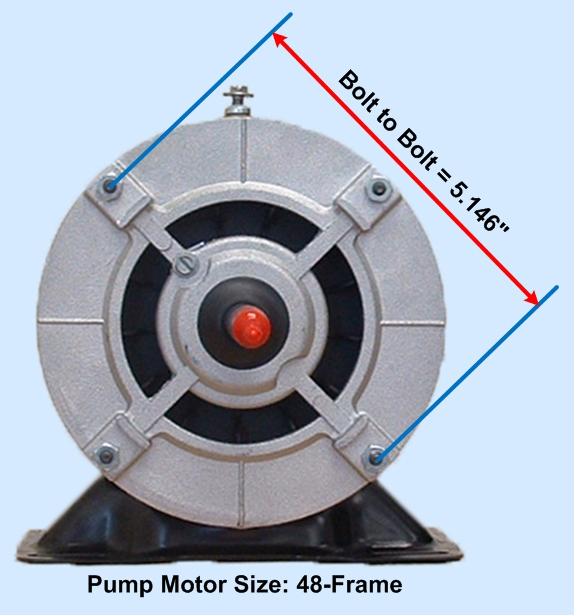 Circulating pump motors are "low" speed (1750 RPM). (3) Identify the amperage and ALWAYS choose a replacement motor with the same or higher amperage on high speed. NOTE: All the motors are identified by original motor manufacturer catalogue number. Catalogue numbers are issued by the motor companies to be used by distributors. 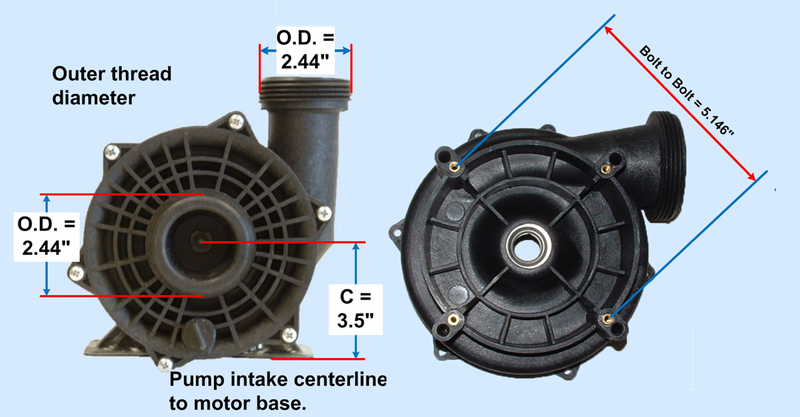 Motor manufacturers also assign EMI numbers (also known as part numbers) to pump manufacturers to distinguish between distributors and pump manufacturers, however all motors are the same. Hot tub pump manufacturers supply pumps to spa manufacturers such as: Alp Spas, Affordable Spas, Action Spas, Hot Spring Spas, Sundance Spas, Vita Spas, Maax Spas, Saratoga Spas, Clear Water Spas, Caldera Spas, LA Spas, Dolphin Spas, Diamante spas, Sensation Spas, PDC Spas, Hawkeye Spas, Morgan Spas, US Spas, Cal Spas, Advanced Spa Designs, Thermospas, Aquamonde Spas, Aquamonde Hot Tub, Free Flow Spas, Viking Spas, Sweetwater Spas, Aspen Spas, Nordic Spas, Apollo Spas, United Spas, Life Spas, True Force Spas, Country Leisure Manufacturing, Catalina Spas, Caribbean Spas, Curtis Spas, Hydro Spas, Spa Manufacturers, Atlas Spa, Pacific Marquis, Beachcomber, Aris Spas, Tuff Spas, Sun Ray Spas, Leisure Bay Spas, Master Spas, Blue Ridge by Jacuzzi, South West Industries, BullFrog Spas, Sunset Spas, Paradise Spas, Turbo spas, Spa and Tub Manufacturer, Sunquest Spas, Spa Crest, Spas by Design, Spa Plus, QCA Spas, South Pacific Spas, Anton Spas, Charisma Spas, Sunrise Spas, Bahamas Spas, Santa Barbara Spas, Safari Spas, Bradford Spas, US Spas, Four Wind Spas, Millennium Spas, Seaside Spas, Icon Spas, Keys Backyards, Hot Tub Factory, Gulf Cost Spas, Gatsby spas, Emerald Spas, Blue Falls Mfg, Aber Hot Tubs, Aqua Mystique Spas, Aqua 4 Fun Spas, Aquamarine Spas, Tiger River Spas, Aquatique Industries, Australian Spas, Baja Spas, Blue Water Spas, Classic Spas, Clipper Spa Manufacturer, Clear Water Spas, Caldera Spas, Watking Spa Manufacture, Hot Spring Spas, Royal Spas, La-Z-Boy Spas, Fort Wayne Spas, Esther William Spas, Coast Spas, Water Edge Spas, Cal Spas, Cal Spa, Rio Swim Spas, Diamond Back Spas, Pacific Pool and Spas, Artesian Spas, Izzi Manufactuing, Jacuzzi, Seven Seas Spa, Monalisa Spas, California Cooperage Spas, Coleman Spas, Caldera Spas, Swim Spa Manufacturers, Strong Spas, Aries Spas, Artic Spas, Roberts Hot Tub, Alp Spas/Associated Leisure Products, Bullfrog Spas, Carribbean Spas, Country Leisure Spas, Curtis Spas, D. M. Industries, Dakota Spas, Diamonte Spas/Sensation Spas, Dimension One Spas, Dolphin Spas, Goodlife Spas, Grecian Spas, Hawkeye Spas, Islander Spas, ITT Industries/HydroAir (Europe), Jetpool (Brazil), Leisure Spas/Sedona Spas, Life Spas, Lifespring Spas, Marathon Spas, Mountain Springs Spas, Orozco International Spas, Pacific Fiberglass, Pacific Pool and Spas (Canada), Phoenix Spas, Platinum Spas, Seacard Pool and Spas, Sequoia Spas, Sunbelt Spas, Sunquest, ThermoSpas, US Tooling Spas, United Super Spas, Vortex Whirlpool Systems, Inc. and many others. Spa manufacture submit their spas for testing under UL standard 1563 for US, CSA for Canada and CE for Europe. ***We do not provide assembly instruction for "DIY". 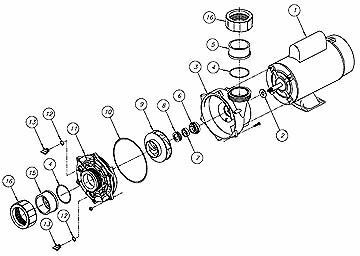 Parts sold as "DIY" are not warranted by Acura Spa Systems, Inc. Just as tire alignment is critical for tire wear on your car, proper motor shaft alignment to the pump is critical for the longevity of the pump. 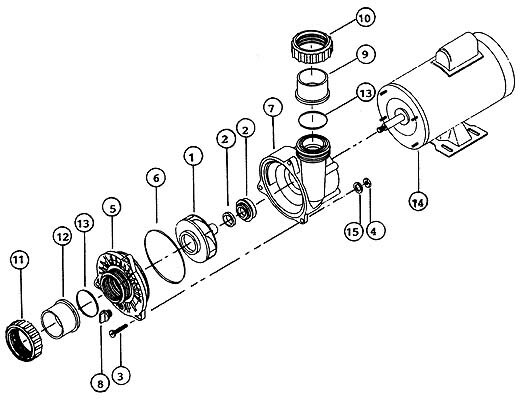 At Acura Spa System, we use factory made jigs to ensure proper alignment when we assemble the pumps. 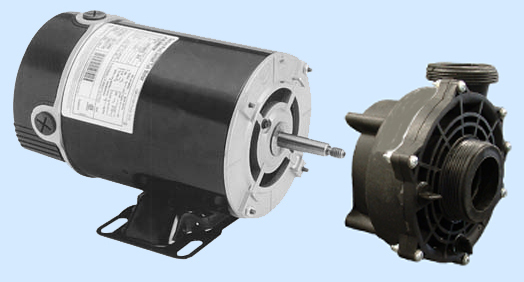 All motors are new as supplied to us and tested by the motor manufacturer. Acura Spa Systems only box the motor and ship it. We do not test the motors under the "DIY" program. 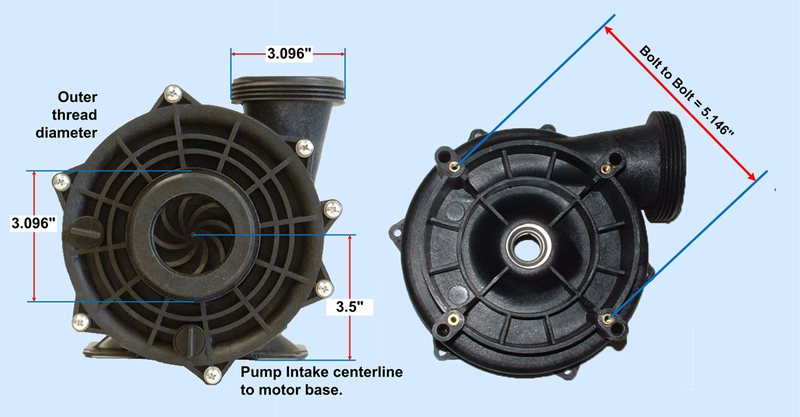 Our complete pump/motor assemblies are always water tested and assembled properly with the proper alignments.